As a motorcyclist, do you feel you have “fast” days and “slow” days? Sometimes you’re in a great mood and really into the road and the machine. You ride aggressively,focusing on smooth corner entry with a late apex (on public roads) and vigorous acceleration at corner exit, for miles and miles of winding back roads. On other days you choose to simply relax and meander. This has always struck me as one of the many differences between a passionate enthusiast and a pro racer. A pro is never allowed to have a not fast day. It does not matter if jet lagged, in a foreign country, upset about some personal issue, and bags lost on the way to the hotel from yet another airport – it’s time to practice or qualify and to be fast. Right now. I am sort of glad I never had the talent to ever approach such a life circumstance. Motorcycle choice does affect this. The Muzzy Raptor I once owned was essentially a road race bike with a license plate. It did not suffer fools gladly, and had no interest in just poodling around. The Kawasaki ZX 12R I owned could accelerate so hard the information was streaming into my visor faster than my brain could process. My Triumph Speed Triple was a few steps back from those, and could be a fine companion on a “slow” day, although it seemed to prefer a more rapid pace. Whatever your motorcycle, you are constantly evaluating risk vs. reward. Going fast has been a reward for men and women since the first ox cart got smoother wheels. How fast are you comfy with? How fast is the bike comfy with? A Triumph Rocket 3 can go very fast, but I always felt that if an error was made by the rider, the bike would take out a house or a small forest on its way to disaster. Harleys may be designed for cruising, but one of the best rides of my life was on a winding back road on a Road King. Here again, the mass of the thing was always present, but it was fun to be aware of it and control it – more or less. Yesterday I was riding relatively slowly on Ben Howard Road. This is a lovely stretch of 10 miles or so east of Seattle that runs from Monroe to Sultan along a river, rising and falling through fields and trees, with many corners of differing degree. I’ve been riding this road for decades, and it is a favorite. What came to mind were the Isle of Man races I’ve been watching on TV this week. Ben Howard road resembles parts of the Isle of Man course, except Ben Howard is a bit wider, and I was going up to about 65 miles an hour, where the current lap record at the Isle of Man is an AVERAGE of 137mph! That makes you think. For me, the risk vs. reward ratio at the Isle of Man is terribly out of whack. Over the past century and more, an average of one racer per year has died at these races, and many of us feel slightly guilty about enjoying the coverage. It is awesome to watch, but the price is exorbitant. One of the many reasons some people like motorcycles is identical to one of the many reasons some people do not like motorcycles. Your fate is usually in your own hands. You can dial the degree of risk up or down as you choose. Modern motorcycles are much safer than the steeds of yore, with ABS brakes and traction controls and triple disc brakes – but you can still choose to “ride like a knob” at any time, and you will bear the responsibility for the result, whether good or ill. Compare this to cars. I had the opportunity to drive a Mercedes Benz 500 AMG convertible around a race track at speed about a decade ago. It was so frustrating! No manual shift, of course. Worse, there were so many safety electronic bibbity bobs present that the car did not want to do what I wanted it to do. The race instructor in the passenger seat was telling me to hit the inside rounded curb with the inside front tire, but the car would apply brakes and other systems to make sure the car did not act as desired. After a couple of laps I wondered what you would have to do to make the car crash! I have never pondered that on a motorcycle. The risk is always right there, attached to your hands and feet. I had a friend who died in a motorcycle accident years ago. He was a custom painter, and a very nice guy. Unfortunately, he liked beer. A lot of beer. His favorite pastime was to sit at a bar in the evening, and then ride home at speed. His bike was a Sportster with (natch) a lovely custom paint job. I had a mild argument with him once about the likely consequences. His Sportster had stock suspension and brakes, and the stock headlight. I told him his pastime would end in disaster, and one night it did. Many people blamed the guy who backed out of his driveway at 11pm as my friend came roaring down the suburban street at 60 mph. I did not. With choice comes responsibility, and when you are given the opportunity to select your chosen level of risk, you then will accept the consequences, whether you like it or not. Does this include all sad endings? Of course not. Sometimes you are not doing anything wrong, not at risk, and yet the world can suddenly go pear shaped. I experienced this in driver training (!) a long time ago. I was driving down a suburban street, and up ahead I saw a milk truck at the curb and kids playing on the lawn. “I remember this from the film!” I thought. I moved to the middle of the street and took my foot off the gas. As I was coasting by the milk truck, the ball bounced into the street, and a little boy ran out and planted his face into the door! The instructor was out of the car before it stopped from 15mph. The little boy got a swollen lip for his trouble and wet his pants. I am surprised I did not do likewise. When we went to move the car we discovered that I had braked so hard that all four tires were stuck to the asphalt, which came up in pieces when we moved the car. The driver’s ed instructor used me as an example for years that sometimes you can have an accident even when doing things perfectly. So I am pondering all of these heavy thoughts when I come to the site of… an accident. Not a motorcycle, but a late model Mustang GT 350. The road runs downhill into a sharp left 90 degree corner marked as 20mph. 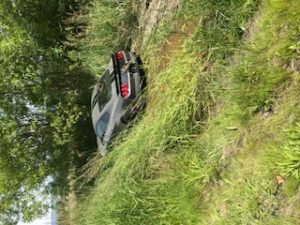 The Mustang had not completed the corner, run off into the weeds and flown through the air, landing in about a foot of mud and water and greenery, which it plowed through for twenty or thirty yards. A pickup truck had stopped, and it looked like nobody had been injured, so I continued on. Later, on my way back home, I took the same route in reverse, and as I had guessed, there was now a tow truck on the scene. Then I noticed the car did not have a rear license plate. “Where’s the plate?” I asked. “In the car,” he mumbled. By now the little voice we all have in our heads was screaming at me. “Get thee hence – now!” I was not comfortable with the situation at all, as it seemed that the driver really needed to be answering questions from someone wearing a badge and armed with a gun. Although I wanted to see what the tow truck driver did, as he was now waking around and obviously deciding whether to pull the car out frontwards or backwards, I chose to listen to the voice. I took a last look at the car and noticed that the left from headlight opening was all covered up with lots of black duct tape. Clearly this was not the first adventure for this car. 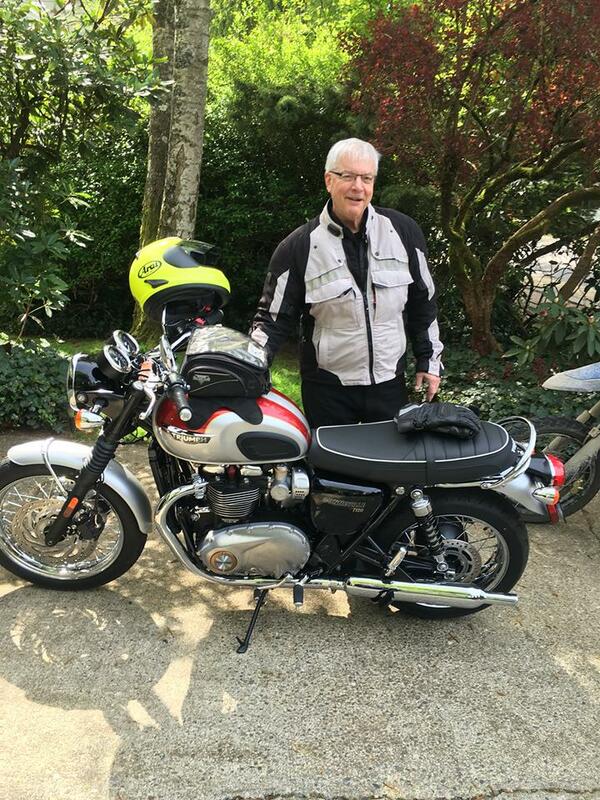 Having assessed the situation, I got back to the Bonneville, strapped the helmet on my head, and rode away. I realized that in analyzing the situation and the dodgy people involved I had applied risk vs. reward in a different way. I rode home at even a slower pace. I’m 61 and in my fourth year of riding. Risk and reward is on my mind all the time. The most recent example is the High Occupancy Vehicle (HOV) lanes in Minneapolis/St. Paul. They are ‘separated’ from the rest of the freeway by a double-white line. Motorcycles are permitted in this lane. Although people are not supposed to cross these lines, they often do. Recently, during rush hour, a driver (no passenger) quickly crossed two lanes to enter the HOV. The car almost ‘took me out’. I’ve concluded that, for paint-based HOV lanes, relying on the integrity and knowledge of other drivers is probably not worth the risk. Thank you for the comment – brought back a memory. In 1970 I was sideswiped by a guy in a white van while riding on the freeway in Minneapolis – with a friend on the back. I was knocked to the right, almost hit the Armco, and then slid and swerved across four lanes of busy traffic to the left hand edge – all without hitting anything or crashing! The clutch lever was bent around my fingers where the door hit it, and there was a blotch of white paint from the van on the front tire. No damage to me, but my friend had a badly swollen ankle where the van hit him – a visit to the hospital cleared him. The trooper who came along looked at the lurid skid mark across the lanes and said “You mean this all happened and you did not fall down?” He couldn’t believe it, and neither could I. The driver of the van was horrified and offered to pay all the damages and for my friend’s hospital bill. By the time I got back to Seattle he had changed his mind – the jerk! Yes, Sir David. Dialing up and down the risk has always been a challenge for me. I sometimes get so comfortable “in the zone” I lose all sense of risk as the brain screams for more information as I tackle the variables and put them in place, which makes me more comfortable to add more. This happened most strongly in mountain biking, where the world becomes three dimensional, especially on downhills. Arguably, mountain trails are more “closed course” than our public streets yet those uncontrollable variables that will kill you exist everywhere. Wildlife and equipment failures were the factors that surprised me most. Becoming aware of what “can” happen quickly became another variable in the mix which became a powerful and effective governor. Knowingly aware of the potential became my best control so when I exceeded the zone envelope of information processing, the result was an acceptance of my fate. Motorcycles on public streets our risk includes not just ourselves, but the potential to harm others. Fully seating that in my consciousness was a challenge yet it is my constant endeavor to not harm others and take full responsibility for myself. What best helped me is that I, too, had the “kid into my fender” moment there was no way to avoid. The kids parents and police endeavored to assure me yet I truly believe and daily feel that moment helped me understand and apply a modicum of control my life needed. I am constantly referencing that moment which allows a greatly needed balance. Thank you for the thoughtful piece.